Here at WSU Spokane, we are currently working to redesign our website. One feature we are considering is a feed of Instagram photos that use the #SpokaneCougs hashtag. These photos with that hashtag would be featured on a page under the “Student Life” umbrella. It’s a fun way to connect with current and prospective students and is something that we’ve studied from other universities. But while this all seems like a good and fun idea, we must think about any unintended consequences. We can’t make this an automated feed because we aren’t in complete control of the content. We’re asking our public to use #SpokaneCougs, and that can easily be hijacked. 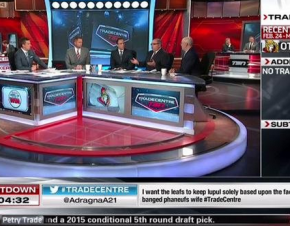 Exhibit A: TSN – the ESPN of Canada – recently used “#TradeCentre” (they spell it like that up north) during the NHL’s trade deadline day for Twitter users to use when discussing trades. Use the hashtag and your tweet could be on air. Sounds cool and fun. A tweet that insinuated one NHL player had an affair with his teammate’s wife – actress Elisha Cuthbert – made its way on air. The tweet – seen by millions on TSN and then retweeted nearly 600 times – got some major attention. Trade deadline day in the NHL is almost a national holiday in the land of Dudley Do Right (no relation). It got so much attention that the two players mentioned in the tweet threatened a lawsuit. The obvious question is: how did that tweet make it on the air? The question TSN needs to ask itself internally is how did that error come about? 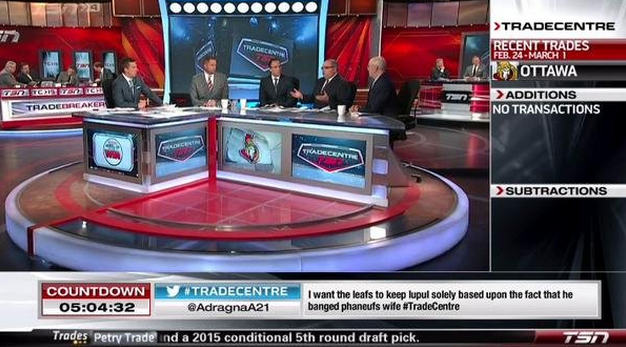 Was there someone monitoring the #TradeCentre hashtag and decided that the tweet was perfectly fine for viewers to see? If so, is that individual still collecting a paycheck from your network? Or was the network lazy and allowed the tweets using that hashtag to automatically appear on air? I have a hard time believing the latter. If the feed was automated, I’m guessing we would have seen a lot of other vile tweets, given the state of the Internet these days. The lesson: if we want to include social media feeds from our publics, we better make sure everything is monitored and whatever shows up on our website or network is fully vetted.